Where do you see your career headed in the next few years? Do you find it difficult to get ahead at work, but don’t know how? Ideally, over time you should get better and better at your job and either get a promotion (and then another and another), start earning more, or both. To advance your career over time, you don’t always need to have this huge epiphany and switch jobs or make a big decision out of the blue. Often times, your career will progress and you will gain a promotion after you make a consistent effort to learn new skills and take small but effective steps forward. Here are six quick weekly tasks you can do to get a promotion and advance your career over time. No matter how busy you are, you can find 10-15 minutes per week to do these things. Before you get started with the work day, get clear on what you want to accomplish so you can ensure you’re doing your job well and maximizing your productivity. Get into the habit of writing down or typing up your objectives for the day or week to make sure you’re on track. This isn’t to say that there won’t be bad days on the job – because trust me, everyone has them – but planning out your work day with clear goals will help you stay on track and improve your work performance. 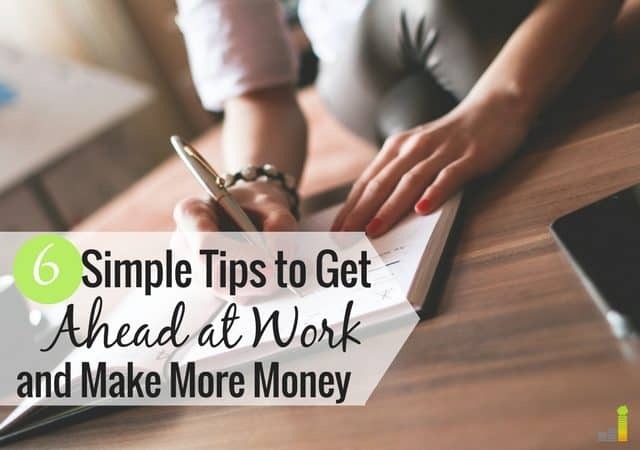 That way, when it’s time to negotiate a raise, ask for a promotion, or move on to another job, you’ll be more than ready with your list of accomplishments and efficient work ethic. Your network is very important regardless of what you do for work. If you want to get ahead at work, it’s important to connect with and stay in touch with people in your industry because you never know who you’ll end up partnering with in the future. Networking can seem forced and opportunistic when you are reaching out to someone just because you need something. Instead, focus on building relationships with others in your industry regularly by sending out a friendly email, sharing an article with them, commenting on their social media post, etc. You don’t have to bother the same person each week so feel free to reach out and connect with different people. Participate in social media groups every now and then. Bring business cards with you just in case you run into someone when you’re out. If you recently attended an event or presentation, take a few minutes out of your day to send someone a thank-you note or follow-up email. You don’t have to be miserable at work to look at job postings online from time to time. Even if you’re very content with your job now, it doesn’t hurt to see what else is out there. For me, I like to see what type of qualifications and responsibilities are being asked for to see how my skills match up. If a specific position requires five years of experience in a particular field, you’ll have a general idea of what you’ll need to qualify should you head down that road in the future. Who knows, maybe you’ll come across a job opportunity that really interests you and you can brush up on your interview skills. Reading industry news is a great way to stay in the loop and see how your line of work is changing over time. Even as a part-time blogger, I find it interesting to check in with the industry by reading timely articles that give me a heads up about how things are progressing over time along with which practices are becoming more popular and which ones are becoming irrelevant. By keeping up with industry news and trends, not only will it be easier to get ahead at work, it will be harder to become blindsided by ‘sudden’ changes that affect your line of work. Career development advice and guidance is crucial to your success. If you don’t have the opportunity to attend conferences, training or other presentations, watch a career development-focused TED Talk every now and then. TED Talks are short, inspirational video presentations that often share a unique perspective or lesson that you can use to enhance certain areas of your life. There are many career-focused TED Talk presentations to choose from and I love that most of the presentations are 15 minutes or less. Since they are often short, sweet, and to the point, you can squeeze in an inspirational TED Talk before or after work, during your lunch break, or whenever. Various jobs require you to learn a new skill in order to get a promotion or get ahead at work. While it’s easy and possible to learn new things on the job, you can also take the time to learn and practice new skills online for free. There are several free digital courses and websites you can check out to learn new skills like Coursera and Udemy, which both have free course options. You can start slow and pace yourself in your spare time if you’re not in any rush, but for sure the new skills will come in handy when you’re on the job in the future. At the end of the day, you don’t always have to come up with this groundbreaking career move or business plan out of the blue. 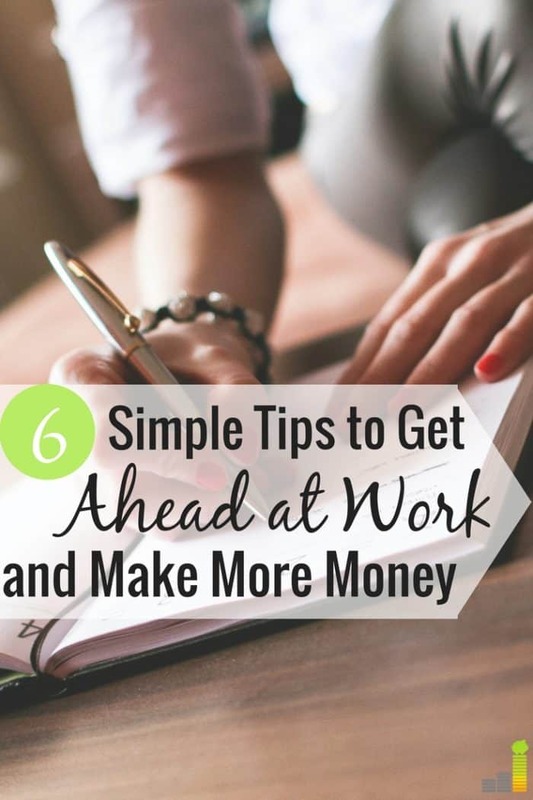 You can advance your career little by little and put yourself in a good position to earn a promotion by doing some of these quick tasks regularly. What are some unique things you’ve done to advance your career? What tasks and habits are you looking to add to your schedule? Where do you go for inspiration career advice? What publications or groups do you follow to stay on top of trends in your industry? TED talks are the best! Great list. I’ve also found it really helpful to ask your boss for specifics about what it would take to “exceed expectations” during your reviews. This 5 minute conversation can be the difference in 2% raise or a 4% raise. It may even be the difference in getting that promotion or getting passed over.